Simple, Flat, Responsive Design. Gone are the overly-complicated designs of yesteryear. Instead, people are looking for a calm, simple environment to deliver the facts they’re looking for. Even shadows and excessive overlapping transparent areas feel wrong as flat design takes over the majority of websites. People also want to access your site on a mobile device, so ensure the website responds responsively based on screen size. The smaller screen will organize the information better for the tiny display while the desktop version will feel full on the larger screen. Consistent Brand and Tagline. 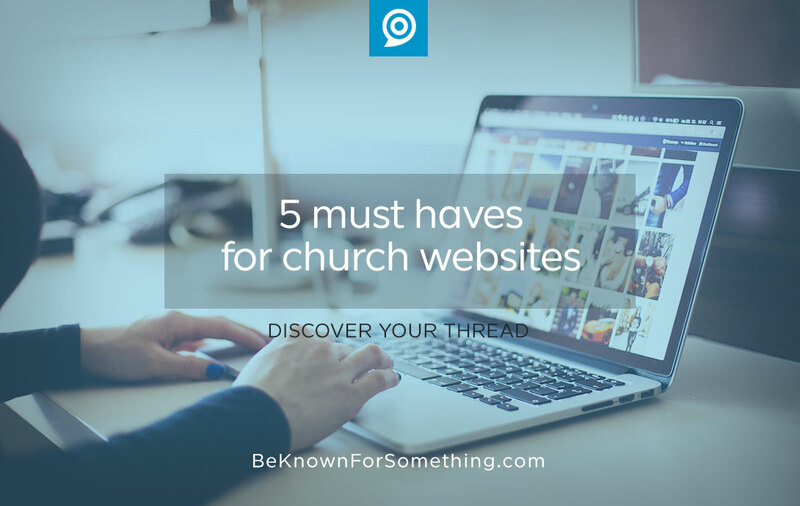 Know the benefit that your church is known for and weave it through your entire website (and as a tagline under your logo as a reminder). Your limited fonts and colors should permeate every page and emphasize your brand story and promise. 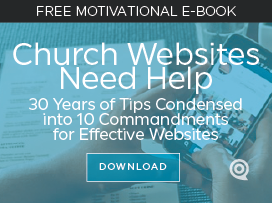 You want the web environment to “feel” like your church when they arrive. Consistency is critical; nothing should surprise or feel out of place as you click around. Up-to-date Simple Content. Your audience wants to trust your online communications. Period. Keep it accurate always. The moment people doubt it, people will not use it. That’s a waste of your church’s money. Service Times and Directions. Most people are clicking on your website to find directions and times. Go ahead and work them into the home page design so they’re easily found (the header is a great place!). Do it simply (just the main service times and a small map symbol or your address that’s clickable). Ways to Engage and Listen. Print material can’t get feedback; so use the interactivity of the internet to the fullest extent. Allow people to fill out forms, leave information, search, and filter. Let them feel like you’re listening and give them what they’re looking for. Then make sure you respond appropriately to them! Every church needs a website and it needs to be set up properly with exquisite organization so your content can be found. Anything short of this is as bad as having a dated, run-down building for your ministries. Show your community you care enough to give them world-class quality. The gospel is worth it!